Layne Mabrey is on the run. Determined to hide their Down Syndrome daughter from the world, her ex-husband wants to have six-year-old Chloe institutionalized, but Layne will go to any lengths to keep her child. Dex Beckett immediately falls in love with both Layne and Chloe, but Layne can't afford to get close to anyone--not even the shy, gentle cowboy next door. She and Chloe have to be ready to run at any moment. Concerned that Chloe's sudden creation of an imaginary friend could be used to substantiate her father's claims, Layne is shocked when Dex offers an unbelievable opinion about the child's invisible visitor. But there's more to Heart's Haven than meets the eye. Is it possible a Christmas miracle awaits Layne and Chloe on the Heart's Haven Angel Tree? Tucked away inside Layne Mabrey’s purse, the last of her money waited to ensure a roof over her and her daughter’s heads. She drove through the double gates, beneath a carved wood sign that read “Heart’s Haven,” heart pounding with terror at this major step towards a new life. But she’d do whatever it took to keep six-year-old Chloe safe and happy. With Chloe clinging to her legs, she made her way up the graveled path leading to the big manor house. A host of blooms lined both sides of the walkway, sweetening the air with their fragrance. They climbed the three steps to the door, and Layne drew a deep breath before tapping on the dark wood. Then they waited, their breath forming little cloudy bursts in the chilly air. From inside, the unmistakable sounds of celebration gave her pause, and Layne gasped, horrified, when she remembered the date. February fourteenth. Why hadn’t she stopped to consider that Andrew Hart might be entertaining on Valentine’s Day? It was, after all, a special, much-anticipated holiday for most people. Not for her though, and she hadn’t given the possibility a single thought. She grabbed Chloe’s hand. With any luck, her half-timid knock hadn’t been heard in the midst of all the frivolity, and she could sneak away with no one the wiser. But, as usual, her luck wasn’t that good. The door opened to reveal an older man with deep grooves around his mouth and crow’s feet crinkling his eyes. Andrew Hart, of course. The man who owned the complex of rental cottages, one of which Layne hoped would soon be home to her and her little girl. The somber fellow looked a little stiff and uncomfortable in impeccable dress-up clothing. In a moment of crystal clarity, Layne knew he donned this type of attire only on rare occasions, and with great reluctance. Every white hair lay slicked into place, but a slight groove in the severely tamed strands told its own tale. Layne bit her lip, amused to find herself seeing the man in a battered old fishing hat, or possibly a baseball cap, and maybe worn overalls. Somehow she thought he’d be right at home in that kind of casual get-up. “Yes?” The gravelly voice drew her up short, and she realized she’d been staring. Even Chloe, her little brow furrowed, gazed up into Layne’s face, clearly confused by her failure to extend a quick greeting. Even as she spoke, a man stepped from behind her and onto the porch. He was tall—so tall that he seemed to loom over them. Chloe stepped close and hid her face in her mother’s coat as she always did when she was frightened. The stranger wore a plaid shirt, cowboy boots and hat, jeans, and chaps complete with fringe dangling on the sides. Taken aback by his cowboy garb, it took Layne a moment to realize he, too, had asked about one of the available units. Mr. Hart handed them both applications and made appointments for the next day, then bid all three visitors a polite good night. 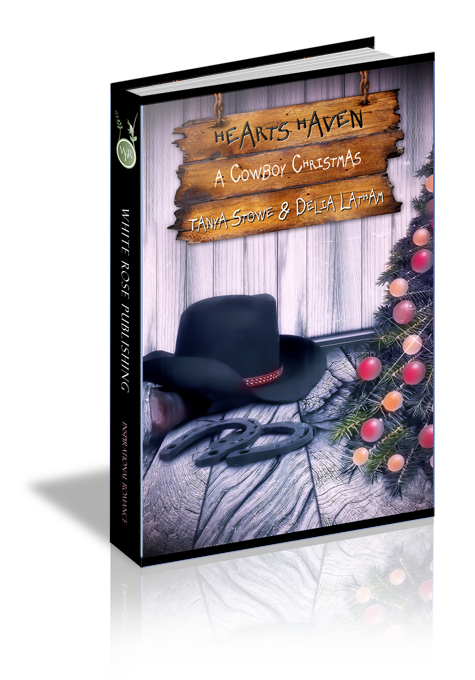 The tall stranger gave Layne a shy smile then walked away, his spurs jangling. The cowboy paused then turned around and headed back with a stride that could only be called intimidating. Chloe wrapped her arms around Layne’s leg in a grip that would have choked her if it’d been around her throat. Layne reached down to reassure her and stiffened. With Chloe’s face no longer hidden, the man would get a good look at her little girl. She braced herself for the reaction that always came when people saw her daughter’s round face and slightly upturned eyes. Usually they became speechless because they didn’t know how to treat a child with Down Syndrome, or they forgot their manners and stared. Layne’s instincts switched into full mama-lion mode, prepared for either response from the long-legged stranger. Instead, he dropped to a crouch and tipped his large cowboy hat back, giving Chloe a clear view of his face. He waited silently until she peeked at him again. Then he turned one boot to the side so she could see the spur. Chloe’s beautiful, blonde, corkscrew ponytail swung rapidly back and forth as she shook her head. Once again, Layne was shocked into silence. Her daughter never talked to strangers, especially men. Layne would have had to be deaf not to hear the almost wishful tone in Chloe’s voice. How was she going to explain this one? Chloe gave him a little half-smile with her lips sealed tight. She’d just lost her first tooth and didn’t like people to see the empty space, so she kept her mouth closed—just one of many little habits. Chloe nodded, surprising Layne again. Then the stranger rose to his full height. Layne looked up and into the most beautiful, caramel-colored eyes she’d ever seen, with lashes so long and dark they were almost sinful. Now who was speechless? She struggled to find the right words. The cowboy seemed to have the same problem. Layne thought he’d invite her to see the horses or at least tell her his name. But the silence stretched on until it was almost awkward. Then the man grabbed his hat and pulled it down over those gorgeous eyes. He nodded once, said, “Ma’am.” Then he just walked away. Layne stared after him, still wondering what happened to her voice.